General Orders No. 5, 1pp. 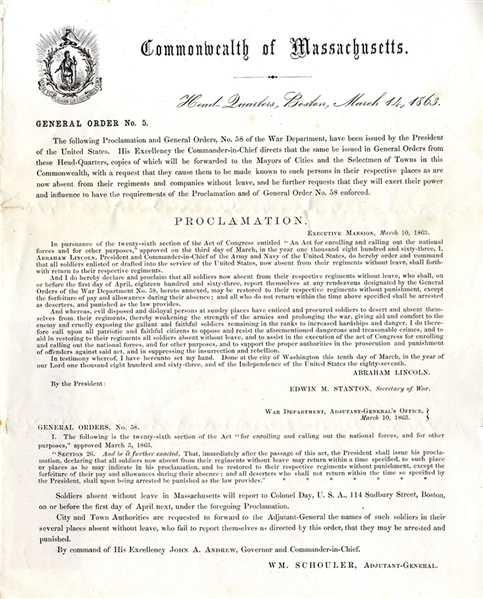 quarto, March 14, 1863, Head Quarters, Boston, Massachusetts, being a PROCLAMATION issued by Abraham Lincoln from the WHite House on March 10, 1863, stating that all soldiers who have deserted can return to their regiments without punishment if done before April 1, 1863. Fine condition.